I am a Software Engineer by profession. Some of the accounting concepts involving operating leases, pensions, stock options, deferred taxes, and long-term debt issuances sound arcane to me. When I encounter them in the annual reports I ignore them. This limitation didn’t bother me much until I read one of the principles of Penman – Ignore Information At Your Peril. I have decided to educate myself on these concepts by writing about them. This post is first in the series and it’s going to be about accounting for long-term debt issued by a company. What is complicated about long-term debt? I had the same feeling until I noticed one of the debt issued by 3M which is given below. We will understand how the accounting for debt issuance works by answering the questions given below. Let us imagine that on 01-Jan-2015 company A is issuing a two year bond with a face value of $1,000,000 and coupon rate of 5%. At the time of issuance the interest rate in the market is 6%. Since the market rate of interest is higher than the coupon rate, investors will pay less than the face value of the bond. How much will they actually pay? Investors will pay $981,414.51 for the bond. The calculations for how I arrived at this value is given below. How did I arrive at the cash flows of $25,000. I multiplied the face value of the bond $1,000,000 with the coupon rate of 5% and divided the result by two. Why did I divide by two? In the US coupon payments are made semi-annually. For calculating the present value I used the discount rate of 3%. This is because at the time of issuance the market rate of interest is 6% and since coupon payments are made semi-annually the discount rate should be half of market rate. Spend sometime to understand the calculations. The company will record this transaction in its books as given below. Both the asset and liability accounts go up by $981,414.51. In the world of accounting Dr. stands for a debit entry and Cr. stands for a credit entry. On 30-Jun-2015 the company will make a coupon payment of $25,000. But in it’s income statement it will record an interest expense of $29,442.44. Why is that? The interest rate at the time of bond issuance was 6% and since this is a semi-annual payment the interest rate will be 3%. On the bonds payable of $981,414.51 the interest expense comes to $29,442.44 ($981,414.51 * 0.03). The company will record this transaction in its books as given below. In the world of accounting the sum of all debits and credits must match. If not we will violate the golden rule Assets = Liabilities + Equity. Since the interest expense of $29,442.44 does not match the coupon payment of $25,000 we need to add a credit entry to account for the deficit of $4,442.44. This in turn increases the bonds payable from $981,414.51 to $985,856.94 ($981,414.51 + $4,442.44). On 31-Dec-2015 the company will make a coupon payment of $25,000. But in it’s income statement it will record an interest expense of $29,575.71 ($985,856.94 * 0.03). The company will record this transaction in its books as given below. This time there is a deficit of $4,575.71 which gets added to bonds payable. The company will make similar entries in its books for 30-Jun-2016 and 31-Dec-2016. The summary of the entire transaction is given below. Spend sometime to understand how the value of bonds payable goes up over time and it eventually matches the face value. This doesn’t happen by accident. Now its time to answer the questions that I had on 3M. For company A if I were to prepare the annual report on 31-Dec-2015 then the notes for long-term debt will look as shown below. On 31-Dec-2015 the company has a bonds payable liability of $990,432.65. But it need not pay anything to the investors on that date. It should pay $1,000,000 when the bond matures on 31-Dec-2016. The carrying value went up from $981,414.51 to $990,432.65 because of the deficit that arose due the difference between the coupon rate and the market interest rate at the time of debt issuance. When a bond’s coupon rate is lesser than the market interest rate at the time of issuance it is called as a discount bond. The proceeds the investors pay for a discount bond will be lesser than the face value of the bond. This is what happened in the case of company A and also for 3M. As time progresses the carrying value of the bond will match the face value. Sometimes bonds issued by a company can have coupon rate greater than the market interest rate. Such bonds are called as premium bond. The proceeds the investors pay for a premium bond will be higher than the face value of the bond. Let us imagine that on 01-Jan-2015 company B is issuing a two year bond with a face value of $1,000,000 and coupon rate of 6%. At the time of issuance the interest rate in the market is 5%. Since the coupon rate is higher than the market interest rate this is a premium bond. The entire calculations over time is summarized below. This should be straightforward to understand as the calculations for a premium bond is a mirror image of discount bonds. Sometimes bonds issued by a company can have coupon rate equal to the market interest rate. Such bonds are called as par bonds. The proceeds the investors pay for a par bond will be equal to the face value of the bond. Let us imagine that on 01-Jan-2015 company C is issuing a two year bond with a face value of $1,000,000 and coupon rate of 5%. At the time of issuance the interest rate in the market is 5%. The entire calculations for par bonds is given below and this should be straightforward to understand. 2. 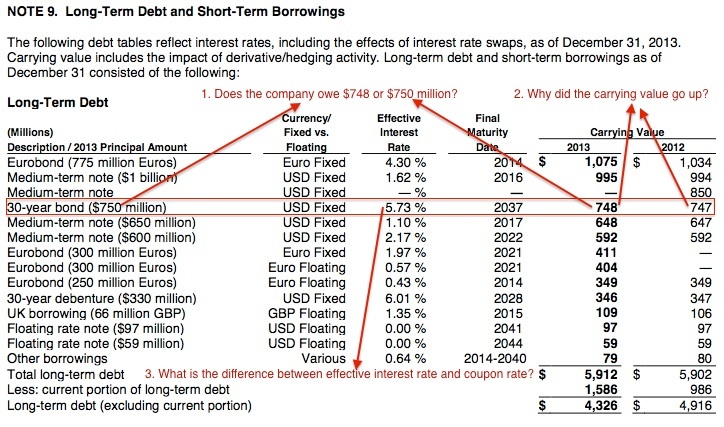 What happens if a company retires the debt early? Sometimes a company can retire the bond early before the actual maturity date. Let us assume that company A decides to retire its bond on 01-Jan-2016. How much should it pay to buy back the bonds. Should it pay the face value of $1,000,000 or the carrying value of $990,432.65? In order to answer that question we need to know the market interest rate on that day. Let us assume that the interest rate is 4%. The company has to pay $1,009,707.80 to retire the bonds. The calculations for how I arrived at this value is given below. The company will record this transaction in its books as given below. Since the company paid $1,009,707.8 which is more than its bonds payable liability, it needs to book a loss for the difference of $19,275.15. This loss is shown in the income statement. This is required to satisfy the rule that sum of debits and credits should always match for the equation Assets = Liabilities + Equity to stay in balance. Basic accounting is about 500 years old. I am fascinated to see that the basic framework of double entry booking is still the same and it handles myriad of complex transactions. I learned these concepts by reading the book shown below. Also I took the Financial Accounting course from coursera. I would highly recommend this course for anyone who wants to know how the financial statements are put together. Thank you for taking time & explaining this Jana! They are insanely arcane, I always used to ignore them too. But this motivates me to devour an annual report on this topic, when i pick up one next. Please continue your series on accounting and its nuances. Thank you for a wonderful summing of the issue!